Janek Performance Group announced that it has been included on the 2016 list of the Top 20 Sales Training Companies that excel in helping sales leaders improve the performance of their sales teams. The list appears in the June issue of Selling Power magazine, which will be available to subscribers the first week of June. 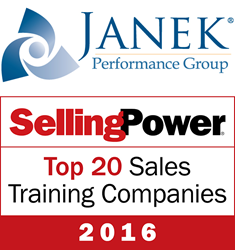 This marks the third consecutive year, Janek Performance Group has been included in Selling Power’s prestigious list of top sales training companies. In addition to making Selling Power’s list, Janek Performance Group was also named to Training Industry’s “Sales Training Companies Watch List” for the sixth consecutive year, and was honored twice during the 2016 Stevie® Awards for Sales & Customer Service in March, receiving a Silver Stevie Award for Sales Training Practice of the Year, and a Bronze Stevie Award for Sales Consulting Practice of the Year. For more information on Selling Power, please visit http://www.sellingpower.com or call (540) 752-7000. Gerhard Gschwandtner is the founder and CEO of Selling Power and the publisher of Selling Power magazine. He conducts a popular Daily Report video series featuring interviews with top sales and marketing executives and CEOs, and he regularly hosts the Sales 2.0 Conference. He is a recipient of the Sales & Marketing Executives International, Inc. 2010 Ambassador of Free Enterprise Award. Read his blog at http://blog.sellingpower.com. Janek works with a broad range of clients in a variety of industries to provide the resources, expertise, training and consulting services to address today’s toughest sales challenges.